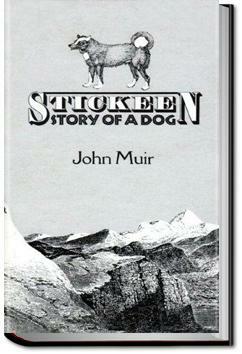 A great dog story, a well told tale — the naturalist and adventurer John Muir recounts how he and his companion, a dog named Stickeen, each, alone, confronted and conquered their fears of an icy Alaskan glacier. . . .Stickeen, who, finding I had left the camp, came swimming after me to see what was up. A wonderful story told by my husband's hero, John Muir. This book is very special to me and my family. Stickeen's owner Samuel Hall Young was my great-great-grandfather. I am happy to see that so many people have enjoyed it. It is a wonderful introduction to John Muir. It reveals much about the man and the small dog named in the title. I would recommend this short book highly to everyone who would like a taste of Muir's magnificent nature writing and heroic character. When we arrived in Colorado this year for summer vacation, my father sat the entire family down to a family meeting. His terms: 1- to spend time with each of the grandsons, and 2- to read this book to the family. It was, as my oldest said, "a lot better than I thought it was going to be!". The actual text I hold in my hand is by Heyday Books (copyright 1981) which was reprinted from the original 1909 Houghton Mifflin Edition.